You can monitor your storage in the Syncplicity Taskbar Panel and in the Settings window. When you open the Syncplicity Taskbar Panel, the bottom of the panel shows how much space you have and how much you have used. The Storage tab provides details on how much space is used by your active files, deleted files, and previous versions of those files. If you have space in multiple locations, click on each location to see the space used and available in that location. Once you have used your allocated storage, you and users accessing your shared folders will not be able to upload files. 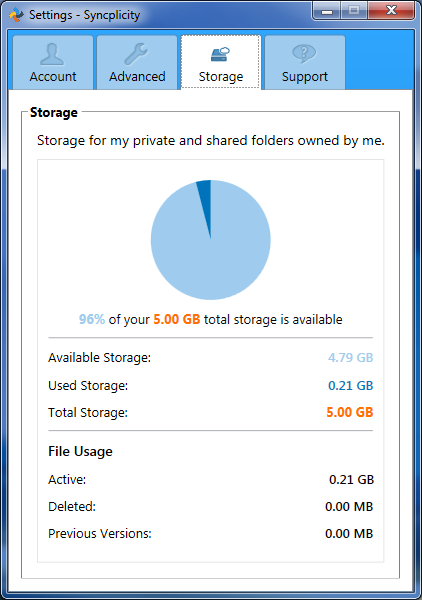 Also, in the Manage Folder window, the folder appears in red along with a message stating that no storage is available. There is also a link so that users can click to email you and inform you of the problem. If your deleted files use a significant amount of space, permanently delete the folder containing the files as described in the Deleting folders article. You can also permanently delete specific files in the web client as described in the My Syncplicity Working with files article. If you have multiple storage locations and plenty of space in a different location, consider creating a new shared folder which automatically uses a location where you have space. You can then share files from there.